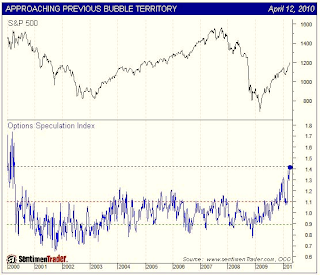 Zero Hedge has posted a chart of the Option Speculation Index by SentimenTrader.com. This index measures speculative call buying as a % of total option activity. 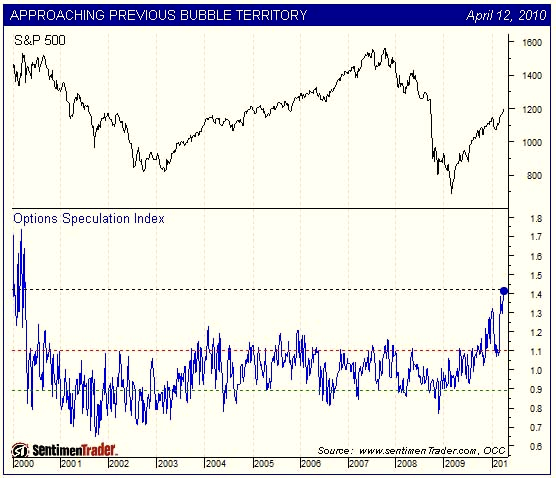 We are currently at highs not seen since the peak of the Internet bubble. Wow, it is truly amazing. But given the RSI strength we're seeing, and the decent (though not great) breadth numbers, I think this market's going to grind up some more. As Hussman has pointed out lately, this kind of market is likely to keep grinding up to marginal new highs for longer than you might think. And shorts are going to keep getting ground up if they're too aggressive, too soon. Until we start to see some new divergences develop on the daily chart (and maybe even on a weekly chart), with RSI less than 70 on a RSI 9 setting, I don't think we'll see any sizable dips. The biggest mistake that bears are making right now is thinking that the "overbought" RSI condition should lead to a sharp drop. But they fail to recognize that it is instead indicative of a strong, bullish market. Until divergences develop as I said above. But eventually it will get severely stretched with large divergences and we'll have a breathtaking drop along the lines of Feb '07. I don't know when that will develop but I think your time frame is probably right (a couple weeks or so). Just have to watch it develop. I'm looking to add some put protection, but not yet. But as it gets cheaper here I may decide to take the insurance sooner. Bears beware, IMO. And eventually bulls will get schwacked for their complacency.